Grand Hotel Magenta i Paris, Frankrike : Boka nu! Endast fastigheter med recensioner på de senaste 12 månaderna får ett betyg. 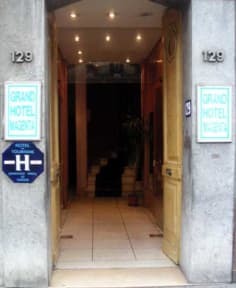 Our hotel is a budget hotel, located just a few steps from Eurostar Terminal, Gare du Nord and Gare de L'est. The Paris Opera house, Montmartre, Sacre Coeur and the Grand Boulevards as well as almost all the important monuments of Paris are within walking distance or accessible with a direct metro line from our hotel. 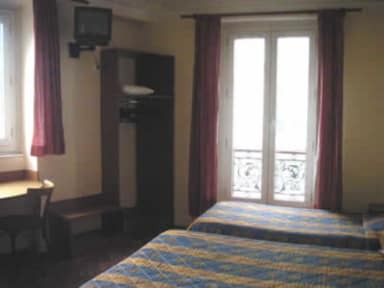 Grand Hotel Magenta combines comfort with style at affordable rates. We serve BREAKFAST in the mornings. Our staff speak several languages and we have all the shops, metro and bus stations, laundry and supermarkets nearby. Do not forget, we will do everything to make your stay in Paris an enjoyable one. PARKING .There is a very huge parking place 30 meters from the hotel. IMPORTANT : The three, four and five people rooms and some of the double rooms have their own shower inside but if you reserve the rooms who doesnt have shower inside ,you have to pay 3 euros to use the shower. IMPORTANT : Please let us know if your arrival time will change. Special Condition : This hotel is free to ask all guests to provide him the credit card CVC code at any time before the arrival. If the client does not provide the CVC security code within the deadlines set by the hotel and for which the customer will have been informed beforehand by e-mail, the hotel reserves the right to cancel the reservation without any other notice. HOSTELWORLD will be then informed about your cancellation.